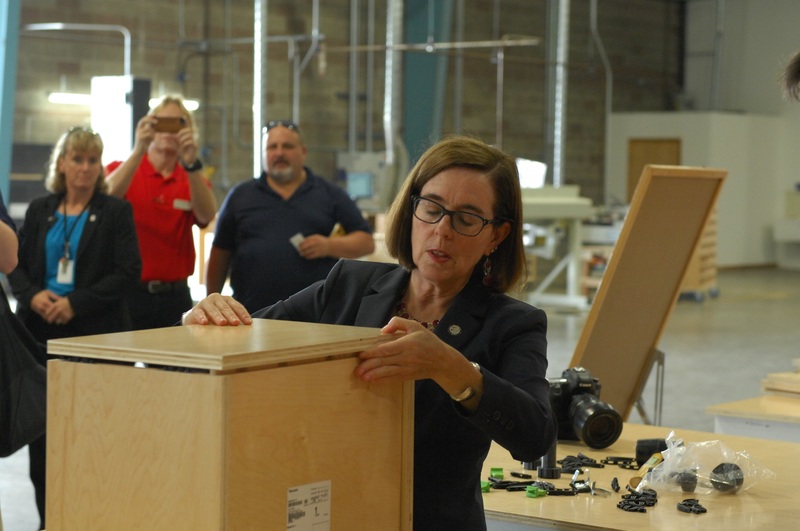 In what could be a model for more widespread outsourcing of custom cabinet boxes, Cabinotch Innovative Solutions has opened a new factory in Salem, Oregon, and the venture attracted wide notice, including a visit by Oregon Gov. Kate Brown. Cabinotch was born in 2011 when a small cabinet manufacturer invented a system of face-frame cabinet box construction that used interlocking joinery. The boxes could be precisely manufactured using CNC equipment and then quickly and easily assembled by hand. 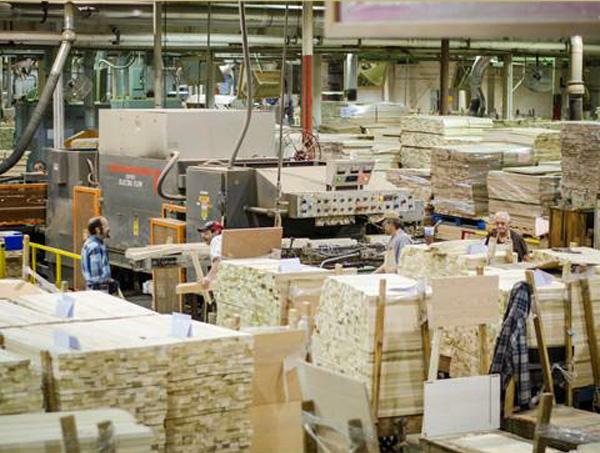 Columbia Forest Products purchased the company and has been expanding the concept ever since. Most recently, Cabinotch developed a “full-access” (frameless) version that uses Lamello connectors for easy snap-together construction. Cabinotch Managing Director Mike Lee shows Gov. Kate Brown how a Cabinotch box goes together. While it took the governor a minute or so to assemble the box, a competition held later in the day showed that boxes could be assembled in as little as 23 seconds. Oregon Gov. Kate Brown said the new Cabinotch plant in Salem, Oregon, shows the importance of the wood products industry in today’s economy. Later, Gov. Brown took to the podium to officially welcome the new factory to Oregon. 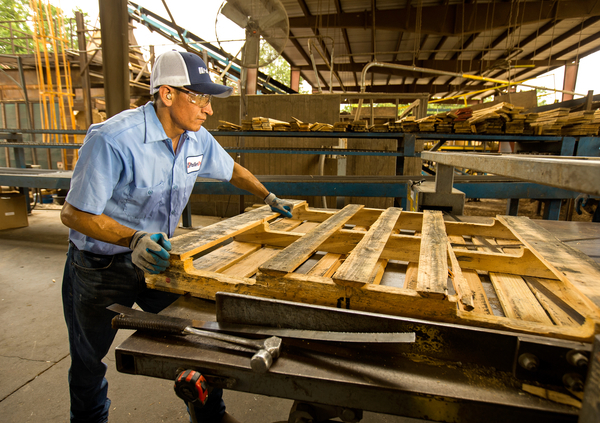 “It’s absolutely critical that we have companies like this coming to Oregon and expanding in Oregon,” she said, noting that it shows that the wood products industry continues to play an important role in the state’s and nation’s economies. The new Oregon facility encompasses 32,000 square feet and currently employs just six people in a very automated process. Lee said the factory will eventually have 25 employees turning out 400 cabinet boxes a day when it reaches full capacity in six to eight months. The new Cabinotch plant in Salem, Oregon, encompasses 32,000 square feet and includes a C.R. Onsrud router and a Brandt edgebander. As shop owners, media, and public officials looked on, Cabinotch staff explained what makes their system and factory different from conventional cabinet manufacturing. The idea is to offer a truly custom cabinet box as an outsourcing option to custom shops so they can increase their own manufacturing capacity and focus on other parts of a custom cabinet project besides the boxes. Integrated with KCD Software, the system is designed to produce face-frame or frameless boxes variable to 1/64-inch increments. John and Leslie Murphy of KCD Software were on hand during the demonstrations, answering questions and explaining how the interface between KCD Software and Cabinotch can work seamlessly for existing KCD Software users, as well as new users online through the Cabinotch website. An efficient interface with KCD Software allows Cabintoch users to design their cabinets completely custom to within 1/64-inch increments. After a design is uploaded, Cabinotch processes it for production on CNC equipment, where parts are cut from sheet stock and lumber; nested for maximum yield. Shipped flat-packed, ready to assemble, orders typically deliver within seven days, which often is faster than the shop owner can produce the parts internally. The new factory featured a C.R. Onsrud CNC router and a Brandt edgebander in addition to other equipment. After seeing the facility and manufacturing process, one Oregon custom cabinet shop owner said he looked to using the Cabinotch system to add capacity to his operation without adding more employees. One of two kitchens designed during the event is machined on the C.R. Onsrud router. Cabinotch products are either prefinished using zero-emission, 100-percent solid UV coatings or are prepped for custom finishing by the shop owners. During the course of the grand opening demonstrations, two kitchens were designed and cut out on the CNC machine. After the demonstration, the two kitchens were destined for Habitat for Humanity projects. The new Salem, Oregon plant is actually Cabinotch’s second facility. The original factory is in Owensboro, Kentucky, and that facility continues to serve the eastern United States. Lee said that Cabinotch hopes eventually to have 10 regional plants to efficiently serve custom cabinet shops throughout the country. Several people took notice of the idea of small, efficient, regional factories providing environmentally sound products as a new model for manufacturing in which the wood products industry can take the lead. One feature of the Cabinotch boxes is that they all are made with Columbia Forest Products’ Pure Bond plywood, a U.S.-made, formaldehyde-free product. Cabinotch boxes all use PureBond formadehyde free plywood from Columbia Forest Products, which owns Cabinotch. According to a Cabinotch spokesman, small cabinet or woodworking shops’ abilities to compete in the marketplace have been detrimentally impacted by low-cost imports and high-volume manufacturers. Cabinotch seeks to enable small shops to deliver a competitive product while retaining those custom and artistic touches that define artisan work. The Cabinotch cabinet box system, which involves a patented interlocking joint, was developed to help cabinet shops reduce costs and improve productivity. Cabinotch seeks to eliminate waste through its system, maintaining that small shops using Cabinotch boxes will generate less of their own manufacturing waste. Cabinotch’s own facilities are designed for maximum efficiency and minimum waste. That concern for waste extended to the open house celebration, where there was even a plan to avoid waste with the extensive barbecue presented. Lee said the company had made arrangements with a homeless shelter to take the extra food, so nothing would go to waste.